Not that I want to be Captain Obvious here, but the countdown to Christmas is well underway! I say this every year, but I really can’t believe how fast this month is flying, and I’ve already started thinking ahead to our holiday dinner. Whether it’s a low-key barbecue or a huge family gathering, we love hosting, so I’m thrilled that Christmas dinner will be at our home again this year! I realize this may be the first time many of you are hosting a big family gathering, so I thought I’d share a few things that I love when I’m hosting any kind of get-together. I’m hoping there might be something new here, even if you’ve hosted a 1000 dinners. Place cards aren’t just for handing out seat assignments! We have these fleur de lis place cards, and I love how easy and elegant they make labeling the different dishes we are serving. 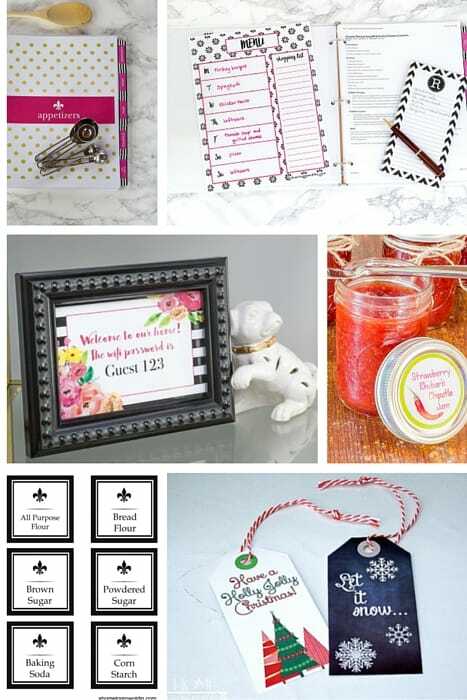 Aren’t they a great way to let your guests know about food allergy ingredients? I also found a beautiful budget friendly version as an alternative option. When we got married we received a set of serving flatware, but after hosting our first big dinner party, we realized that just wasn’t enough. 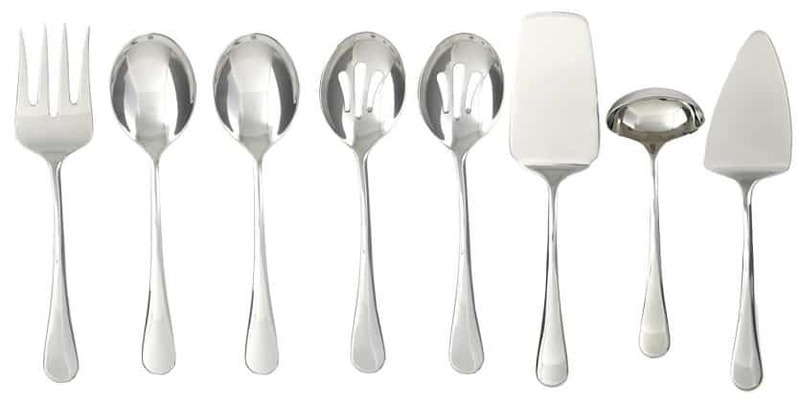 This bigger set should more than have you covered between the numerous spoons for side dishes and serving ware for desserts. Are you short on oven space when cooking all your holiday dishes? 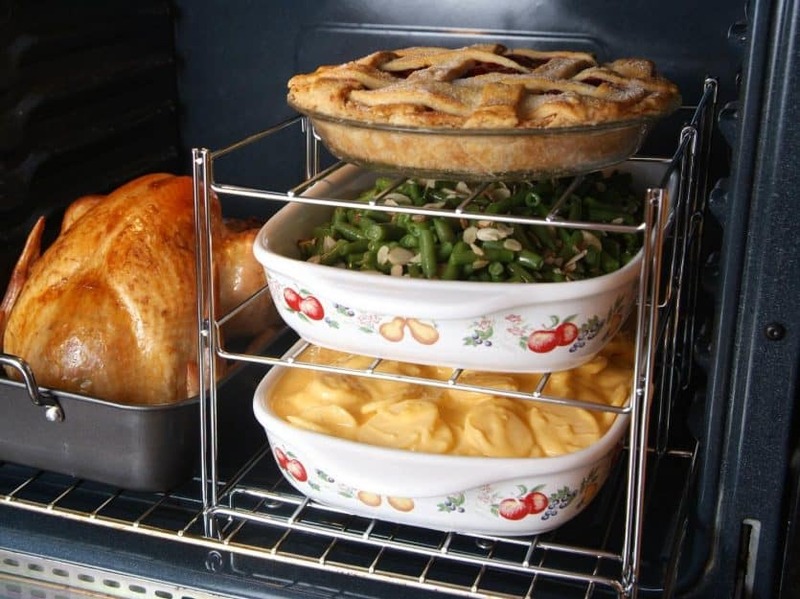 Check out this 3-tier oven rack! 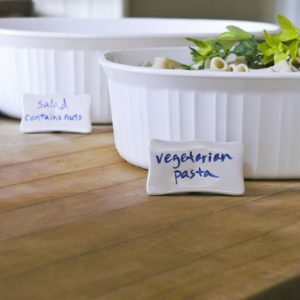 I bought 5 white casserole dishes (2 large, 2 medium, and 1 small) at a closeout sale years ago, and I use them every time we host a dinner or get-together. The great thing about getting casserole dishes in white is that if you add different styles and sizes over the years they will all coordinate. 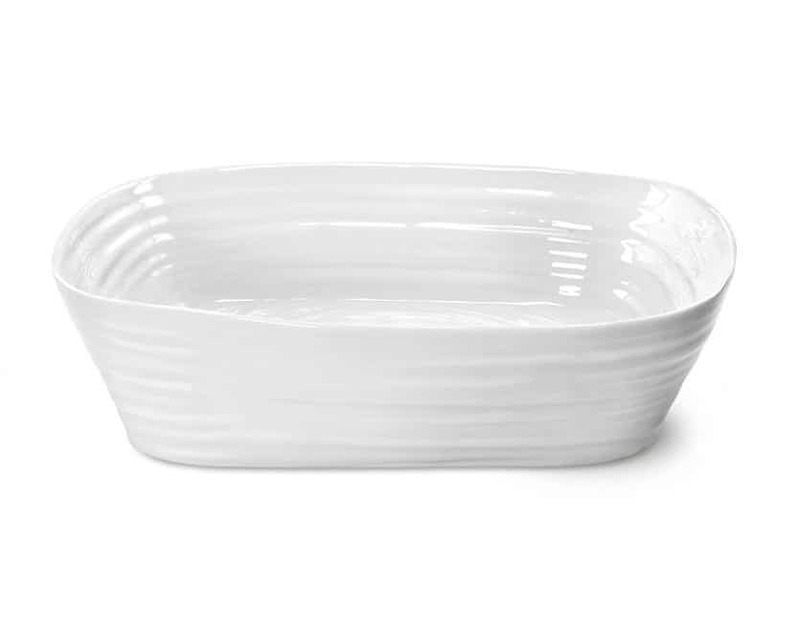 This baker set is a great everyday style (and it’s on sale right now), but I also love the more contemporary look of this dish. We’re more than a little carb heavy at our holiday meals, so in addition to my dirty rice and a couple other starchy dishes, we always have macaroni and cheese. Well, let me let you in on a little secret in case you ever join us for one of our dinners…Costco makes THE.BEST.MACARONI.AND.CHEESE.EVER! Once I tried it, I decided it was not worth my time to ever make my own again. I just spoon theirs into one of my casserole dishes, bake it, and pawn it off as my own. Done! No matter how many I buy, I swear I never have enough trivets to put under all of our hot dishes at the holidays. I love this festive red set, and they’re a nice big size! So, are you hosting your first holiday dinner? If you’re a seasoned pro, what’s the largest group you’ve ever hosted? Last year, we had 16 all staying at our home for Thanksgiving and 12 at Christmas. I’m sure that’s nothing for some you experienced hosts! The oven rack is a great idea. If yo don’t have a warming draw, it would be a life saver. Even with a warming draw I never have enough space for dishes I want to fix early and keep ready to serve. I ordering one! I’ve hosted for upwards of 80 family members for everything from Thansgiving to my Grandma’s 89th birthday. I love that idea of the oven rack! I have a double oven but still run out of room…why didn’t I ever think of that? Thanks for the idea my friend and Merry Christmas!